Only one thread per doll type, please. List condition, price, and month and year purchased. As people reply to the thread, I will copy the info to the first post of the thread, and delete replies. Less clutter that way. If you would like your prices anonymous, you can PM me, and I can post for you. Mint: Out of box, but still in brand new condition. Last edited by Loogie on Sun Dec 02, 2007 9:27 pm, edited 1 time in total. 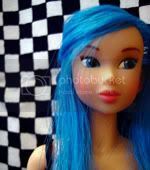 This is a section of the forum to keep track of current doll prices- NOT to sell.